Last year, at Trail Runner's first annual Photo Camp, I had a terrific conversation with Jason Schlarb and Jen Benna, two elite ultrarunners who'd come to run and "model" for the camp. Over beers and a post-run hot-tub soak, we all chatted about the dreamy pursuit of "the perfect race," that magical experience in which the stars align and everything unfolds like a dream. 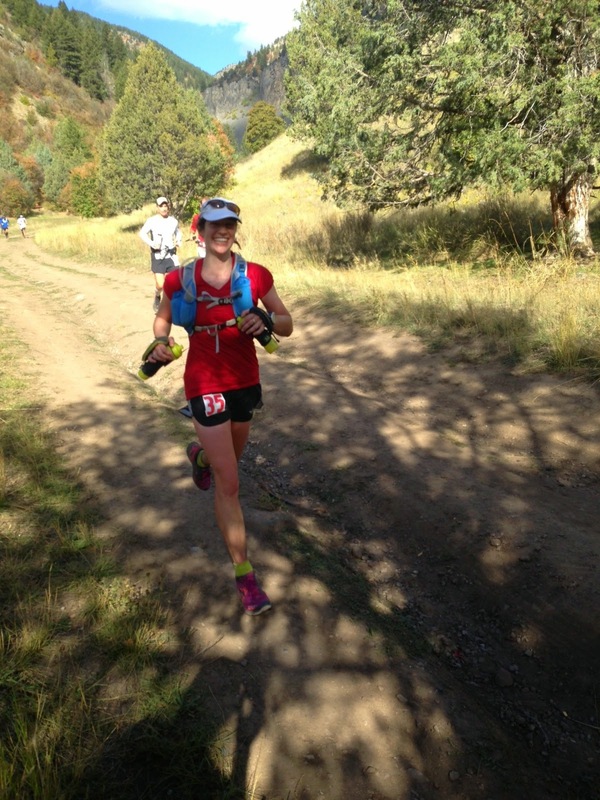 Jen had experienced just that earlier that year at the Zion 100, which she ran many hours faster than any previous hundo she'd done, handily won by over an hour, and smashed the previous women's course record by nearly four hours. A month after our Photo Camp, Schlarb also set his own 100-mile personal record and bagged a dominating win at the hyper-competitive Run Rabbit Run 100. He also not only won, but broke the course record, by well over an hour. Well, I'm no elite athlete, but that doesn't mean I'm not competitive with myself and my own goals. Granted, I tend to favor realistic expectations over ambitious ones, and until the Bear 100 last weekend, I'd never approached a race of that magnitude with a true time goal, other than just to not quit and make it to the finish line. But, I trained hard this year. For my third 100-miler, I felt ready to graduate from the "just finish" mindset to the "race a wee bit" mindset. So I set a goal of finishing in under 28 hours, which felt ambitious for me on the Bear course (22,000 feet of elevation gain), yes, but also plausible. Nevertheless, it's scary to admit goals like this aloud, because if things don't go as planned, it's nice to be able to cop out and say, "Oh, I didn't really care about my time anyway." But, here's the problem: I did. Or, perhaps more accurately, I cared about my goal of wanting to nail "the perfect race." Or even, less ambitiously, to just not fall apart. I wanted to run hard and feel (mostly) good the whole time, or as (mostly) good as it's possible to feel during a 100-mile race. And I felt pretty darn good for most of the race! Photo by Annie Murphy. 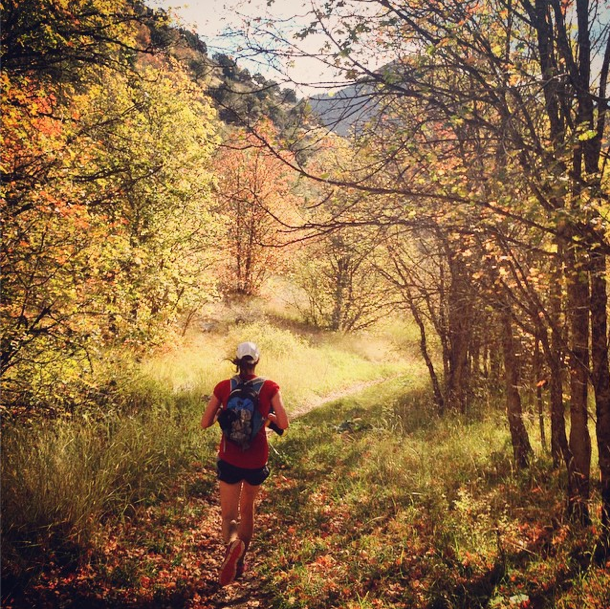 I wanted to be able to look back on the 2014 Bear 100 and say something other than "Everything was great until the sh*t hit the fan between the miles of 70 and 75," which has been the story of the other two 100s I've run. In hundo #1 (2012 IMTUF), around mile 70ish, massive blisters bloomed on every available surface area of each of my toes. I went from being briefly in the women's lead to spending 25 miles wincing in pain with each step and missing the race's already-generous cutoff of 36 hours by three minutes. 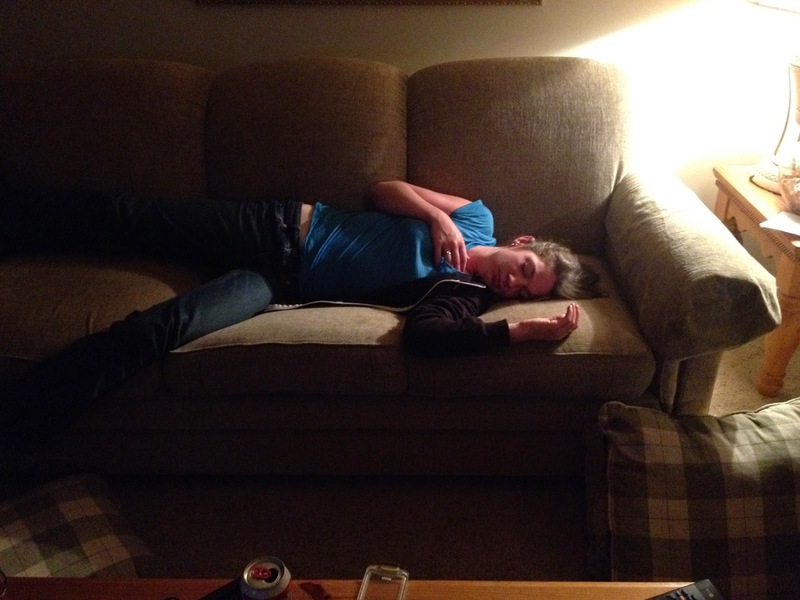 In hundo #2 (2013 Leadville), I got exactly 1.5 hours of sleep the night before the race and thus, by mile 70ish, was literally falling asleep while running/hiking. I stopped to nap on the ground or on aid-station cots many times over the last 25 miles and, like a zombie, crawled over the finish line in 29.5 hours. Last weekend, I was careful to sidestep the issues of #1 and #2—wearing toe socks (no blisters the whole race!) and getting plenty of sleep (didn't even need caffeine to get me through the night this time!). I felt great. Feeling psyched around mile 20. Photo by Annie Murphy. Nonetheless, come mile 70ish, something vicious found a way to rear its head. In this case, around 5 a.m., the skies unleashed a holy terror of freezing rain. The final quarter of the course turned into a muddy slip-and-slide, an outright waterfall in places, that slowed me to a necessary walk—which, in turn, chilled me to the bone. Stubbornly, I'd wanted to run the Bear without a pacer. And I did just that, which, for the most part, I enjoyed. I can't tell you what exactly I thought about during my long, lonesome hours through the night, but I can tell you that I felt calm and joyful. There's magic to be found in solitude in the mountains. Furthermore, people are far more likely to approach and start a conversation with you when you're alone—so, all day and all night, I enjoyed sharing a few miles at a time and great conversations with strangers. I crossed the state line around 4:30 a.m.
... and utterly failed to take a selfie with the sign. But posting this blurry photo to show how happy I clearly still was at that point in the race! But, come the apocalyptic rains, my solitude took me to an especially dark place. I grew cold. I slipped several times, falling and hitting my head against the ground. All the moisture from the rain caused significant chafing on my back and thighs, rubbing my skin raw and bleeding in places. I cried some. I distinctly remember repeating the words, "I've never been this miserable in my life" inside my mind like the refrain to some terrible song. By the time I stumbled into the aid station at mile 85, every one of my layers of clothing and gloves and cap soaked through, I'd convinced myself I had hypothermia, so was fully prepared to quit and go home. I wept there, too, disappointed in myself for giving up—but equally certain that I was, in fact, experiencing a medical emergency that warranted quitting. And yet, when I got there, my crew—my boyfriend and my dad, who also helped see me through Leadville last year—was nowhere to be found. I couldn't imagine doing anything but sitting, swaddled in blankets next to a campfire, so that's what I did. Nearly an hour passed as I sat, shivering and semi-conscious, before I overheard one of the volunteers mention that the road to the aid station was impassable for two-wheel-drive cars. And so it dawned on me that my crew wasn't coming. There would be no piling into a dry, heated car and being gently lulled to sleep on the drive back to a warm hotel room. 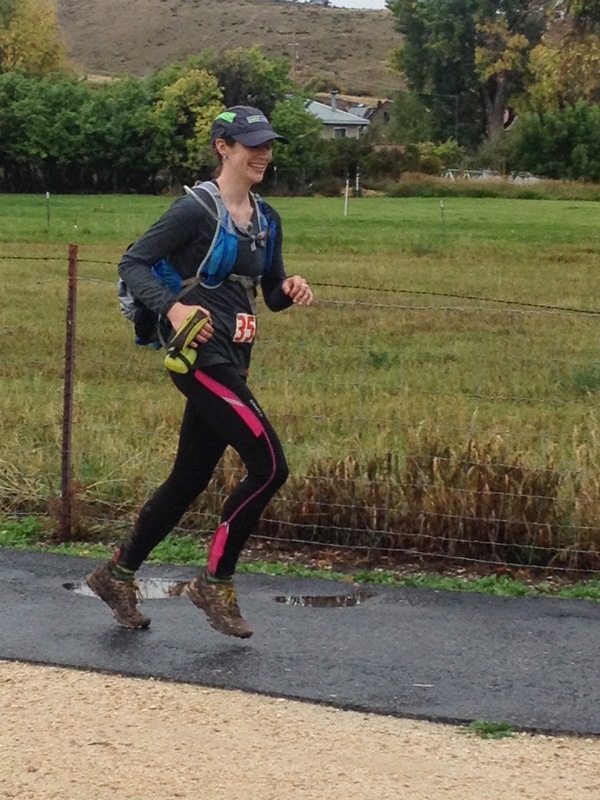 There was nothing but a 15-mile expanse of mud, rain and cold fog awaiting me. Impressionable as I was by then, thanks to the gentle but firm encouragement of a fellow runner and his pacer—thank you, Nate and Ben!—back out I went. Other than the mud on the trails, which only grew worse, everything improved from there on. The rains calmed. My body regained warmth as the coldness of night fell away and I was able to keep up a steadier pace. At the next aid station at mile 92, I happily fell into the arms of my crew, changed into dry clothes and took off for the finish line, thrilled to be "gettin' 'er done." Cruising down the finishing chute, happily outfitted in dry clothes, shoes no longer identifiable under cloaks of mud. Post-race portrait. Thanks for the snap, Jeason. Once again, this sport has thoroughly humbled me. Every time I get the teensiest bit of an ego about my running, something comes along to tear it down. And, for that, I have nothing but gratitude. Ego doesn't belong in the mountains. Great read, Yitka! Congrats on finishing! Yittka, what a splendid physical achievement and what an incredible show of mental strenght. Thanks for writing such a great race report. I felt chilled and out of breath, just reading about it, here in my cozy livingroom with a glass of hot tea. You are amazing!!!!!! Nice writeup. Congratulations on getting out of that chair! Great meeting you this weekend.